Can I tell you how much I love my kids? This past Saturday we had a big party just three of us. My oldest daughter,Kelsey and my youngest Nikolas(unfortunately Ana is in south Carolina and couldn't join us) rocked out in our kitchen. The two of them baked me this fantabulous torte The torte was made with almond meal and bittersweet chocolate. 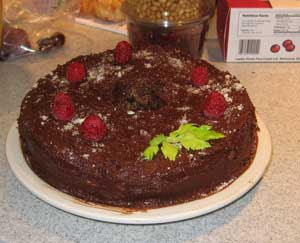 The decorations quite natural; raspberries and a celery leaf(who doesn't decorate with celery leaves?). We ate cake and danced around the kitchen, one song stands out in my mind....it's called Officer by Slightly Stoopid. It is one of those songs that have you singing the refrain over and over,feeling the beat. It is also one of those songs that if you actually listen to the lyrics you have to say......can't play that song for everyone! You might want to check it out but don't say I didn't warn you!